As a strategic partner of Dyneema,the English Braids Racing Dyneema product has been developed with the racer in mind. Available with an SK78 core to provide strength and a 24-Plait cover to give durability to the rope. 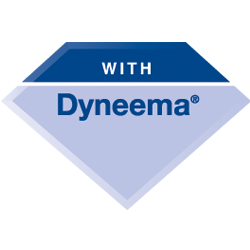 Dynastay is manufactured using Dyneema® DM20 fibres which ensure creep is kept to a minimum. Recently this product has success with riggers looking to replace their steel wire back stays with Dynastay. Dynamic Line is another product which utilises Dyneema fibre to produce a line which has an exceptional break load for the diamteter of the rope. This product can be used to make Dyneema soft shackles.